It is with great pride that the Board of Directors of the California Alfalfa & Forage Association (CAFA) has selected Duane Chamberlain, a prominent Yolo County Farmer, for the Jim Kuhn Leadership Award in 2018. Duane Chamberlain, farmer from Yolo County, California, takes pride in farming quite difficult, class IV heavy clay soils, producing high yields and quality with alfalfa and grass hays destined for the horse and dairy markets. He is a big believer in early fall planting on modified shallow beds for maximizing yields on heavy soils, as in this productive new field in Woodland, CA (November 8, 2018). The Jim Kuhn Leadership Award is presented annually to a person or organization for their lasting contributions to the California alfalfa industry. The award was established in 2005 as a tribute to Jim Kuhn, who was a farmer in El Centro, CA. Nominees are judged on their knowledge of alfalfa, record of leadership, and the extent and depth of their contributions to the California alfalfa industry and to rural communities. Duane richly deserves this award, as he carries and advocates the values that Jim Kuhn inspired in all of us, a passion for farming and ranching, the need for taking leadership for causes that promote agriculture, and at the same time, running a business in an ever-changing world that requires innovation to thrive. 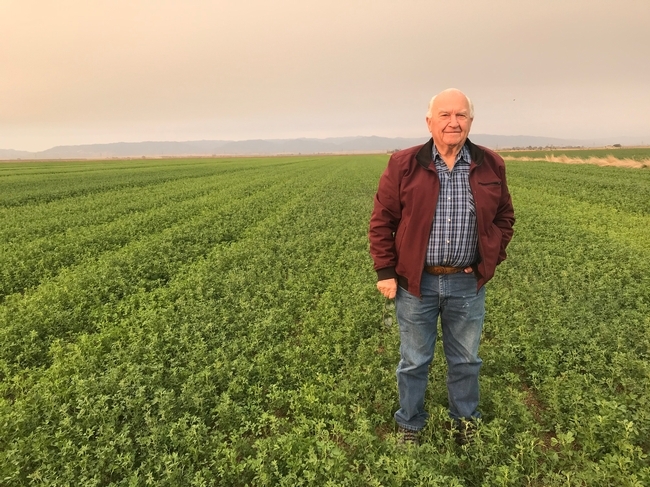 Duane founded Chamberlain Farms in 1963 in Woodland, California, a large-scale alfalfa, forage, and cattle operation. He has had a very interesting career pathway to developing one of the largest farm units in Yolo County. He did not inherit his farm, but built it from scratch by his own efforts – a truly self-made man, and the rewards of hard work and good business sense. He began raising cattle as an FFA student in Orange County, CA and, after graduation from UC Davis with a degree in Animal Science, he served in the army, then worked at UC Davis in a technical capacity for a few years, and subsequently left to form Chamberlain Farms. He slowly developed sufficient capital, and parcel by parcel, expanded his farming operation, taking on difficult tracts of land (poorly drained with low fertility), and developing profitable farming operations with high yielding, high quality crops. Duane produces alfalfa and grass hay, grains, and straw, and develops value-added markets for these products. He sells his hay locally, through Windmill Feed, as well as throughout California, including wheat straw for race horses at Golden Gate Fields in the Bay Area and rice straw for erosion control. He also raises replacement heifers for the dairy industry. He has beef cows and frequently jokes ‘I feed my mistakes to my own cows'. A significant accomplishment is his success in developing a number of innovative practices, allowing him to farm on difficult soils. This includes the use of soil amendments for good nutrient management, carefully managing the soil to prevent compaction, planting early in the fall, choosing varieties with lower dormancy ratings to keep plants dormant until soils dry out, planting on raised 60-inch beds to help with drainage, and adhering to varieties with high levels of pest and disease resistance. Duane developed his knowledge of farming on difficult soils over decades of experience and readily shares his incredible wealth of knowledge about farming with others, for the benefit of agriculture, and in particular the forage industry. Duane is active in the Farm Bureau, the Yolo Land Trust, Audubon California, and the Yolo Chamber of Commerce. As a 4th term County Supervisor representative from rural Yolo County, Duane has championed agriculture in many venues, from supporting organic farmers, to helping the political community understand the loss of prime farmland as a key issue. He greatly values the wildlife benefits of alfalfa. He especially enjoys watching birds forage in his hay fields and easily rattles off their names, curlews, Swanson's hawks, and ibis, three birds that depend on alfalfa for their livelihood, and he knows it. He does not use any rodenticides, and relies on flood irrigation and bird predation to help control gophers and voles. Duane is a big supporter of the University of California and UC Cooperative Extension. He attends our UC Davis Field Days for wheat and alfalfa production, along with the California Alfalfa & Forage Symposia. He conducts research on his fields, working with PCAs, Advisors, and UC faculty. He's always open to new ideas and has generously allowed researchers to work on his farm on many different projects related to forage production that have benefited the industry. This includes studies on stem nematode management, pesticide trials for managing weeds and insect pests, variety trials, nutrient management studies, overseeding trials with other forages to boost stand life, and irrigation studies. Deficit irrigation studies on his farm demonstrated the resiliency of alfalfa during drought periods. All of these studies have resulted in developing information that is of significant benefit to the alfalfa and forage industry. Duane is highly deserving of this prestigious Jim Kuhn Leadership Award for supporting the alfalfa and forage industry, being a leader and promoting agricultural conservation, and being an astute businessman. In addition, he has a big heart in that he reaches out and teaches kids, anywhere from elementary schools through college, by spending time with them on his farm and sharing his rich knowledge, showing them hay harvesting equipment, cows, and hay fields to inspire interest in agriculture for our next generation of leaders.